I have a feeling this is going to the first in a series of letters that God puts on my heart for my precious young ladies of Girls Bible Study. I wish you all could feel the pressure and urgency I have to capture these words on a page – – how fervent my prayers are that you will read them and they will penetrate your hearts and minds. For years, I have sat in a circle with you ladies and prayed for your future husbands. I have also made a point to pray that you all have the patience and faith to trust Gods timing in this most important area of your life. I have talked about the kind of man that God wants your husband to be. And I suppose in doing so, I have assisted you in developing an imaginary checklist in your mind. Now there is nothing wrong with this. 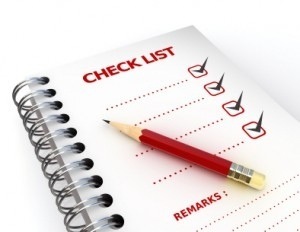 Most young christian women have had a checklist they use to evaluate potential suitors. It is an important part of developing a set of standards to evaluate who may be worthy to walk with FOREVER. However, please hear me when I say this: DON’T TAKE THEIR WORD FOR IT. Resist the urge to ask that young man if he believes in God or Jesus or if he is religious or saved or what he believes in church. There are a lot of ways you can ask that burning question on your Godly heart but there are no words that really answer it. Frankly, if you feel the need to ask it – – there is a good chance that you are more interested in completing a checklist than you are in making sure you are drawn to a true man of God. When a man loves The Lord, it is pretty obvious. You need only step back and observe the beauty of his life. You will see him worship The Lord publicly. You will find him surrounded by Godly friends and usually a Godly family as well. You will see him work hard as if he is working for The Lord and not for man. Even if he is a quiet man, He will talk about his relationship with God. He will tell you about the night he was saved or the miracle that happened to him at church camp. He will serve his God, his church, his family, his friends with the love of Jesus. You won’t be the only one interested in the spiritual element of your relationship. That’s right. . . a christian man has been praying for a christian woman that He can lovingly lead and sacrifice for. He’s just as interested in your character, relationships, worship, and service. So all of your actions and your relationships are either confirming or concerning to that great christian guy who may have his eye on you. It can be exciting to “date” a new believer and guide them along in the breezy days of courtship. But if you find yourself tossing and turning in the winds of marriage, you will feel lost and alone if you are the most spiritually mature christian in your marriage. So resist that urge to help develop a suitor into the christian guy of your dreams. God does not need you to find a Do-It-Yourself project in a man. He will deliver a fully developed, Godly, loving, leading, dream of man right to you – – if you will trust Him to do so. I speak the truth my sweet younger sisters in Christ. And I have used a checklist that failed me greatly. . . so let my bruises and scars keep you from failing. Let the fruits of his life – – speak of the matters of his heart. And just keep walking with God until HE shows you who HE wants you to walk with. . . . This past weekend we were delighted to have my cousin “Rhett Butler” and his gorgeous little girls stay with us for the weekend. During the morning discussion, Rhett mentioned that his beloved wife has a tendency to become lost while navigating unfamiliar terrain. Mr. Rhett Butler is a wonderful protector and provider. He has made it his policy to only buy vehicles with navigation systems in hopes of preventing confusion and distress for his wife. During the course of the discussion, one of his daughters asked a sassy, little question. I had to insert myself in this conversation. I told this sweet little woman-in-training that men do not ask for directions because God has designed them to be warriors on a battlefield. Those who are successful in a battle maintain their single focus on what lies ahead. If they were to stop and ask for directions, they would be vulnerable to injury or death. Instinctively, men know this and they strongly resist any temptation to stop moving. God has made them leaders who are able to find their own way. We women on the other hand would not survive the grueling challenges of the warrior’s journey. We would stop to admire the flowers or ask for directions. In our distraction, we would surely die. 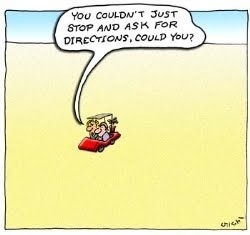 Taking pause to “ask for directions” would prevent us from making it to our destination. My cousin Rhett replied, “Good answer, Carrie-Okie.” He and my husband walked a little taller after listening to that description of the most valiant parts of their souls as men. But I wasn’t quite so satisfied with myself. A twinge of guilt weighed heavily on my heart. You see – – a couple of months ago, I would have answered that question very differently. . . It would have been so witty and entertaining. . . something about men being too stupid to ask for directions or maybe how they need women to do that for them. . . my “funny” and flip answer would have highlighted either the male gender’s helplessness or their stupidity. Boy am I glad she didn’t ask the question before God showed me the real answer. I will leave a legacy for the younger women in my life to carry. Every time they ask me a question or watch me deal with the challenges of marriage – – they transform me into their Titus 2 tutor. I can choose to lead them into Gods light and truth. Or I can leave them in the darkness of the world and their own inexperience. God has blessed me with Titus 2 tutors that speak love and light and truth into my spirit. A few months ago my Auntie D published a blog post that she called “Buyer’s Remorse.” In it she shared a recent purchase: a sassy kitchen decoration that seemed uniquely crafted for her adorable, perfectly appointed farm house kitchen. The rooster decoration touted the lines, “He Rules the Roost. . . . . But I Rule the Rooster.” She snatched it up immediately but confessed that she could never bring herself to display it in her kitchen. When I read that blog post, I must admit that I thought “that’s not that bad – -it’s just a cute little saying.” But this Titus 2 tutor had just given me a class on home decor and marriage enrichment. A decoration that brings disrespect to your husband will never be a blessing to your home. It is not cute, attractive, or funny. No joke is meaningless. They all find their way into our hearts. What if our jokes about the men in our lives and men in general are actually sowing seeds of disrespect that will grow in the hearts of the young and those not yet married? What if we cast men in in a negative light just because we haven’t taken the effort to understand them? Carrie-Okie likes to get a laugh and give her quick wit a chance to shine. . . but she is praying for the wisdom to never accomplish this at the expense of ANYONE’S spiritual growth. . . I want to live a legacy of the beauty of Gods truth . . . especially in relation to the young women He has placed in my life for His purpose. . . I honor my own Titus 2 tutors when I become one myself.